Hello Everyone! It's time for me to share a new card made with products from the Classy Cards N Such Online Store. My card is simple, yet elegant and can be made in under 15 minutes. This would be a great card to mass produce! I started with a base of Pearlized Esse White Metallic measuring 4.25 x 5.5 inches. I ran the front layer through my Cuttlebug with the Holiday Magic Spellbinders M-Bossabilities folder. These are fabulous as they are double-sided embossing folders. I used the "swirly" side. Next, using the Holly Corner from Cheery Lynn Designs and the Stardream Emerald cardstock, I cut out two holly corners and added Baby Rhinestones in Red for the berries. Continuing to work with the Stardream Emerald cardstock, I die cut a Grommet Tag and added Red Rhinestones in the grommet holes. Using white cardstock and Spellbinders Labels Eighteen I die cut a label to stamp my sentiment on and then layered it on top of the grommet tag. That embossed paper is gorgeous! Awesome card! So very elegant and lovely. 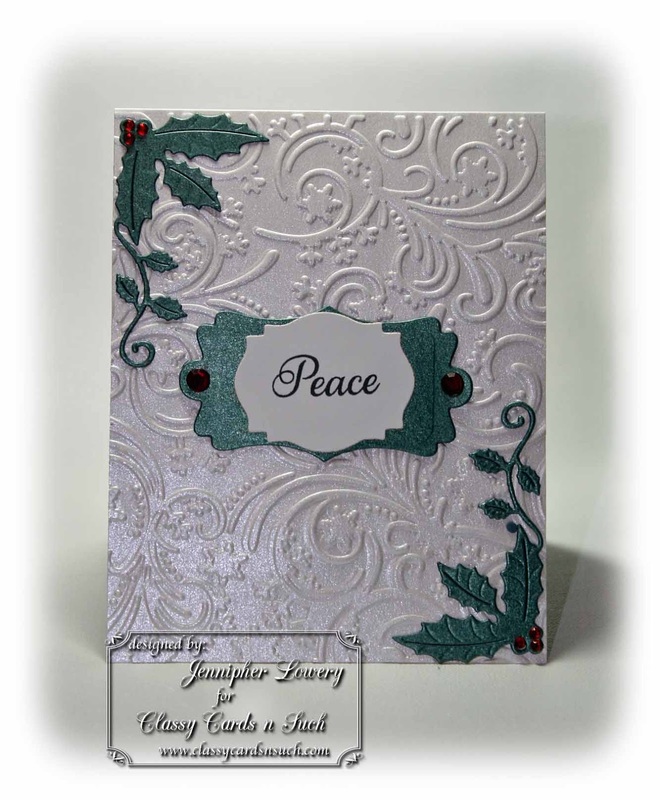 love those double embossing folders! This is so pretty! love the front embossing and the corner elegance and I also like the way the card sits vertically. what a fabulous combination of shapes and textures! This is really a gorgeous Christmas card, Jennipher. Thanks for sharing! 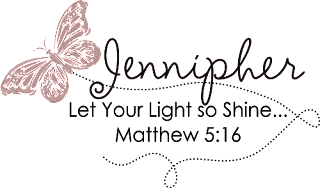 This is gorgeous, Jennipher!! I love any and all embossing but this is really, really beautiful!! So beautiful, Jennipher! I love the shimmer of the papers, and the embossing is just stunning. Very pretty card Jennipher. 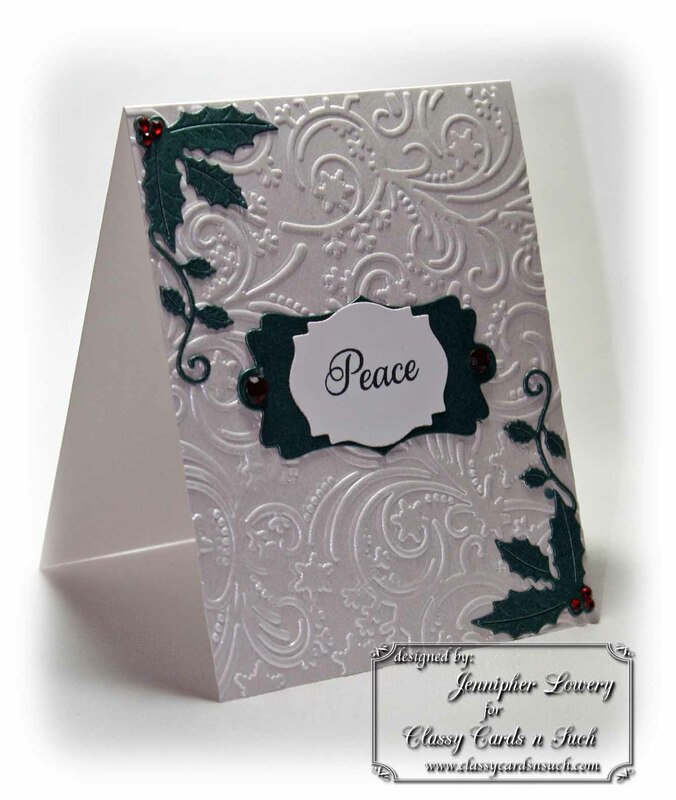 The background embossing is really great with the Holly corners. Love the card. Oh my! Jennipher! This is gorgeous! Love it! Thanks for sharing this beautiful creation with us at SSiC this week! Wow Jennipher your card is gorgeous pure eye candy. So elegant, so beautiful, so peaceful. I love it!!!! It is elegant and how wonderful that you achieved such a gorgeous card in so little time! That is a trick I have yet to master. I find a lot of peace in Christmas too, the greatest gift the world has ever known was given to us at that time and that is where we find our true peace. Thanks for sharing! So pretty and elegant with a gorgeous embossed background.